The Town of Enfield has been rocking the Roanoke Valley since 1740. 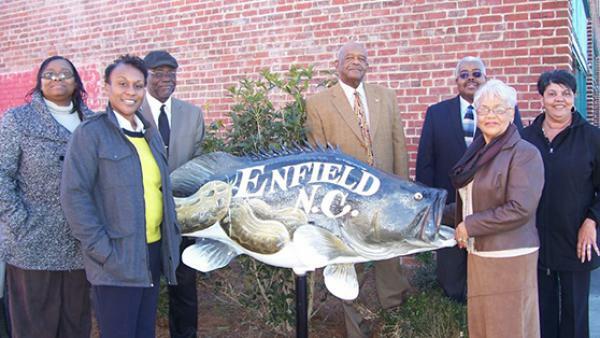 In fact, it boasts being the oldest town in Halifax County. Mayor Barbara Simmons says she sees the town “on the rise.” In the past five years, 17 new businesses have opened doors in town and include a wide array of goods and services, including a wedding venue, fish market, coffee shop and hair salon, among other things. Enfield is home to the annual Peanut Festival, which began over 25 years ago and celebrates the town’s historical claim to fame as one time being home to the world’s largest raw peanut. Today, the town boasts a community spirit that is evident in the new community park that was built through grants. The park features softball and soccer fields, volleyball and basketball courts, a walking trail and an after school program. Two other town parks have recently been renovated. “The people of this town really pull together,” Mrs. Simmons said. “They are very quick to approach me and say, ‘What can I do to help?’” Enfield’s community spirit really Rocks the Roanoke Valley!